Another great tournament is in the books! BORP Goalball Invitational XXII, on Saturday, December 10, was a wonderful day of spirited competition, skillful play and community engagement! 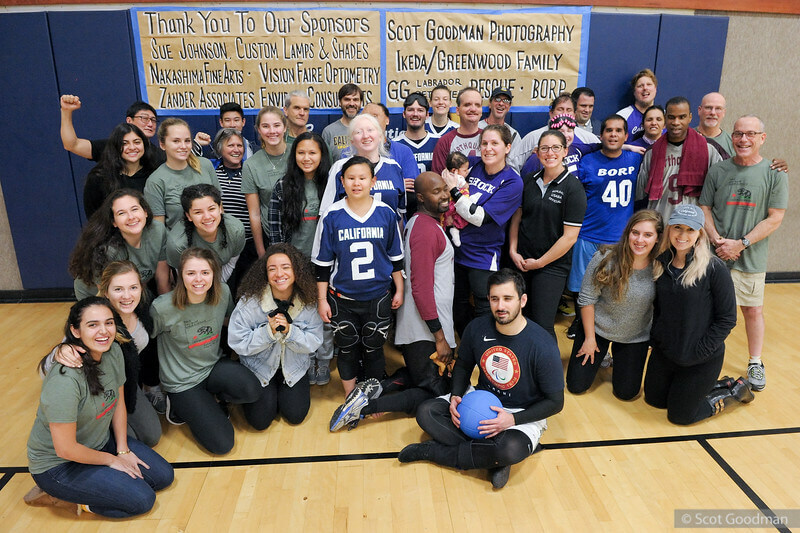 Group shot of all the Goalball players and volunteers after the BORP Goalball Invitational XXII. Photo courtesy of Scot Goodman. 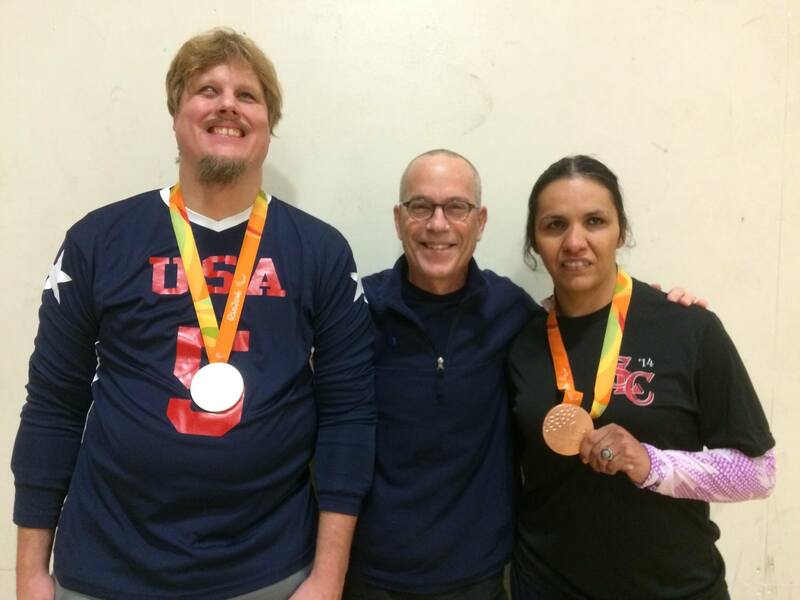 Joe Hamilton (left) who won silver with the men’s Goalball team and Christella Garcia (right), bronze medalist in Judo, with BORP’s Adult Sports Programs Coordinator, Jonathan Newman (center). We were honored to have two 2016 Rio Paralympic medalists join us for the day: Joe Hamilton won Silver with the USA Men’s Goalball Team and Christella Garcia won a Bronze in Judo. Five teams took the court to determine BORP Goalball supremacy and the ultimate champions went undefeated to claim the crown. CAL Bears and ZaZa’s All Stars got the tournament started with a run-away that turned into a nail-biter. CAL took a 3-0 lead into the final 3 minutes behind 2 Will Slason goals and 1 from Jessica Adams. With 2:21 left Shen Kuan scored for the All Stars and that’s when the game got really interesting. A 4th goal for CAL from Adams at 1:26 seemed like it would salt the game but the All Stars Sergio Lopez scored with 34 seconds and Mandy Gargano with 15 and the score was 4-3. CAL’s defense held for the last All Stars’ throw (Yow!) and the game ended 4-3 as CAL Coach Newman had a heart attack :-). Game 2 paired Roll City against Tequila Poppers and was a heavyweight shoot-out with each team owning a half. Tequila Poppers used 4 Abel Del Toro goals and 1 from Victor Hakopian to take a 5-3 lead at halftime. Joe Hamilton accounted for all Roll City’s first half goals. In the second half an early flurry of 3 goals in a minute from Grej Presjaka put Roll City on top 6-5. The goals kept coming for Roll City with 2 from Hamilton, 1 from Presjaka and 1 from Jon Marcotte to take a 10-7 victory. Del Toro and Bryanna Stubbert has a goal apiece for the Poppers in the 2nd half. Game 3 was another offensive thriller with a twist. 2 month old goalball rookie fan Zyona “ZaZa” Gargano Young was treated to a match-up between her parents (Mandy Gargano and Brandon Young) as ZaZa’s All Stars (Gargano) took on PKRB (Young). Young’s PKRB squad jumped out to an early lead behind 2 goals apiece from Young and Khemnesuel Fisher. The All Star’s used goals from Kuan and Lopez to stay close and the score was 4-2 at half. The All Stars ratcheted up the offense in the second half as Lopez and Kuan scored 2 more goals each to put the outcome in doubt. However PKRB maintained their lead with 4 goals of their own (Young 3, Fisher 1) and held on for the 8-6 win and family bragging rights for Young. Tequila Poppers and CAL Bears squared off in Game 4 and Poppers, as they say, came loaded for Bear. The Poppers could do no wrong in the first half and took a 6-2 halftime lead behind 4 goals from Del Toro and 2 from Hakopian. The Bears were not without fight and their revitalized second half defense held the Poppers to 1 Del Toro goal while the Bears added 2 to theirs. Final was 7-4 and both teams had much to be proud of. CAL had 2 goals each from Slason and Adams. PKRB and Roll City was a Game 5 shoot-out as each team sent rocket after rocket cross court and into the opposing defense. A 3-3 halftime score was the prelude for an explosion of goals from Roll City that PKRB could not match. The final was 11-6 Roll City. Young tallied all 6 PKRB goals while Presjaka 5, Christella Garcia 3, Hamilton 2 and Marcotte 1 all scored for Roll City. ZaZa’s All Stars and Tequila Poppers showed their defensive mettle in Game 6 and it wasn’t until late in the first half that either team scored. The All Stars got a goal from Lopez to take the lead but Del Toro and Stubbert answered and had the Poppers up 2-1 at half. The second half saw Poppers adding on a goal per Popper (Del Toro, Hakopian, Stubbert) to go up 5-1. The All Stars tightened up their defense and used goals from Kuan and Lopez to draw within 2 but ran out of time and succumbed 5-3. The 7th game of the day was a brilliant defensive “clinic” between the CAL Bears and Roll City. CAL’s Tiffany Zhao made her debut in the middle and anchored a first half shut-out for the Bear while CAL’s Slason provided the only first half goal for either team. The excellent defense continued for both teams through the 2nd half as players for both teams blocked ball after ball. The teams hammered away at each other relentlessly and finally with 3 minutes left Roll City’s Presjaka found a crack in the CAL defense for City’s first goal. With the outcome still in doubt, Garcia blasted in City’s game winner 1 minute later for the 2-1 win. Game 8 offered no relief from the tension of the previous game, only a difference in styles as PKRB and Tequila Poppers staged an offensive fireworks show for 10 minutes that flipped to a defensive struggle at the end. PKRB’s Young was in top form in the first half and his 6 goals led his team to a 6-4 halftime lead while Poppers’ had 3 from Del Toro and 1 from Hakopian to stay within striking distance. In the second half the Poppers’ defense stiffened and relinquished only 1 PKRB goal from Fisher. With 2 minutes left the Poppers had forged a tie behind 2 goals by Del Toro and 1 by Stubbert. Defensive artistry from both teams kept the score unchanged and the game ended 7-7. Roll City and ZAZa’s All Stars matched up for Game 9 and City’s Presjaka was on form early leading his team to a 5-2 halftime lead scoring all 5 City goals. Lopez had the All Stars 2 goals and in position for a 2nd half run. An early 2nd half City goal by Hamilton pushed the lead to 4 and while the All Stars played great 2nd half defense they were matched in that regard by City and absorbed a 6-2 loss. Game 10 was the final game of Group Play and would determine who was in 2nd and 3rd in the group. PKRB needed a 4 goal win over CAL to make the title game as Tequila Poppers held the goal differential advantage. PKRB showed they were ready for the challenge early and used 3 Fisher goals and 1 from Young to take a 4-2 lead over CAL at halftime. CAL had goals from Julie Cabrera and Slason to stay in touch and set up an exciting finish. In the 2nd half PKRB jumped their lead to 3 as Fisher notched another goal but then the Bears put a wall in front of their goal and started chipping away at the PKRB advantage. 2 goals from CAL’s Adams sandwiched around a Slason rocket evened the score 5-5 with a minute left. And after a loooong minute that’s the way it ended. With Group Play finished the match-ups were set for the the play-offs. The 3rd Place game had PKRB and CAL while Roll City and Tequila Poppers were set for the 1st Place game. After a 20 minute break PKRB and CAL took the court and picked up where they left off from Group Play. PKRB had the early advantage behind 2 goals from Fisher and 1 from Young but CAL’s Slason got one back for CAL and burnished hopes for a 2nd half comeback. CAL’s Adams fed those hopes with a quick goal to get CAL to 3-2 and 6 minutes of courageous goalball followed. With both teams blasting away and both defenses in lock-down mode the tension rose with every throw until ultimately PKRB prevailed 3-2. 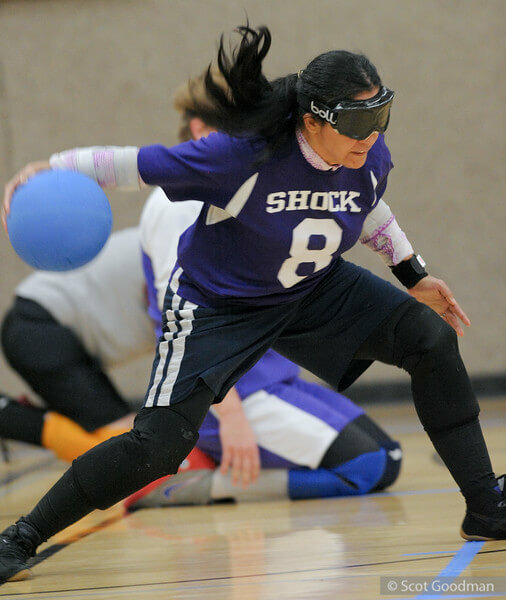 Christella Garcia taking a shot at the BORP Goalball Invitational XXII. Photo Courtesy of Scot Goodman. The Championship between Roll City and Tequila Poppers had a similar script in the first half to the 3rd Place game. City took a 3-1 lead with 2 goals from Hamilton and 1 from Garcia while the Poppers’ Del Toro punched 1 in right before the buzzer. The Poppers closed to 3-2 with an early goal from Del Toro and a quick exchange of goals from City’s Hamilton followed almost immediately by a Del Toro strike had the score at 4-3 with 5 minutes left. From there it was all City as they settled their defense and used 2 more Presjaka goals and 1 from Hamilton to secure the BORP Invitational title. Thanks to all the volunteers, teams, families, friends and sponsors for their generous donations of money, time, goods and services. It is an honor to be associated with all of you and share this wonderful event (that started as my senior project at New College in 1995). Thanks to Delta Gamma (DG) for their enthusiastic support of goalball and BORP throughout the year and especially to Sierra Westhem for her leadership in expanding the collaboration between BORP and DG.